We’re thrilled to tell you that one of our Equestrian themed upcycled vintage cushions was selected to appear on last night’s TV episode of George Clarke’s Amazing Spaces on Channel 4! 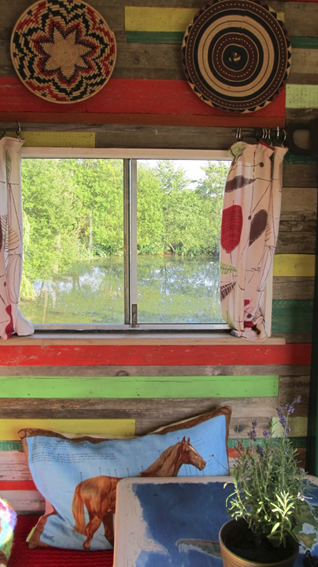 For those of you not familiar with this programme, architect George Clarke presents a show that celebrates the extraordinary world of small design – from secret hideaways and space-saving retreats, to eco-friendly bolt holes and re-conditioned vehicles. In this episode (series 2, episode 4), he meets Chloe Le Fay who magically transforms a smelly old horsebox into an absolutely stunning combined mobile shop for her vintage clothes business Crystal Vintage and living quarters. She managed this amazing feat on a shoestring budget and upcycled a variety of materials (many sourced for free) to create a real success story. This is Gloria before the transformation. Here she is after the conversion (with Mr George Clarke). Here’s our Hunted and Stuffed Equestrian Cushion nestled behind an upcycled world map table. Another view of the dining area – note the beautifulwooden cladding made with upcycled scrap wood. If this is making you feel inspired about the possibilities of design on a budget or in a small space, check out Jane Field-Lewis’ ‘My Cool…’ brand at mycoolhomepage.com Jane is also the hugely creative force behind the Amazing Spaces series and books.